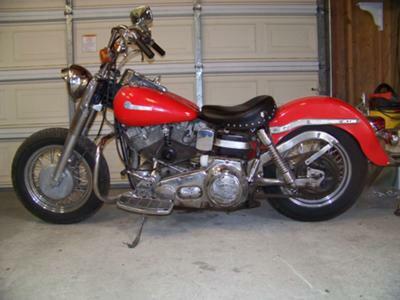 The vintage 1968 Harley Davidson Shovelhead motorcycle is for sale in sunny San Diego California (CA). This bright red beauty is titled as near original slab shovel. This Shovelhead Slab is the closest that I've seen to original factory stock in a long time. I have the original Nacelle, light bar and I will throw in an era correct front fender in the deal. The current odometer reading is a surprisingly low 5,678 miles (or so depending on if I can resist taking it out for a ride myself in between the time that I posted this vintage motorcycle classfied and when the new owner comes to pick it up). Ok, she looks like a dream but interested parties might be interested in running performance. To answer that, I drained the gas from the tank, tinkered with it just a little and she started right up. This vintage 1968 Harley Davidson Shovelhead motorcycle's engine sparked right up and starting purring like a kitten and with a twist of the wrist roared like the elegant old lion she is. include your contact information in your email or to provide a phone number or email address if you leave a message!) so that I can respond with answers to your questions or after consideration of your best offer as quickly as possible. You won't find a nicer old Harley Shovelhead for sale in California, on Craigslist or in an Ebay auction so hurry and make an offer before this excellent example of Harley history gets away from you! Strike Lightning would also encourage bikers to submit a review of the 1968 Harley Davidson Shovelhead to make the biker community aware of any problems that are commonly associated with the old bike or to highlight its positive features and help potential buyers make informed decisions. The picture alone of the Shovelhead is sure to set some purist biker's heart racing in high gear and strip his wiring right down to the metal! Can you send me a description of the paint color of the 1968 Harley Davidson Shovelhead for sale? From the photos it looks like a bright cherry red. But it's brighter so could it be classified as candy or even apple red? Regardless of the name, it's a great vintage motorcycle paint color.